In this journal, the all rights of published manuscripts and legal responsibilities belongs to authors. Even if the copyrights of publications in our journal belong to authors, after this publications are published for this once in Journal of Urban Academy does not demand removing or erasing from the publication of the published manuscripts. Articles published in this journal is not cited without any reference in part or in whole. Author(s) is/are fully belongs to copyrights all his/her/their works published in the Journal. Therefore, legal responsibility related to article contents belongs to authors. In the article submit process, if articles sent for review are not published, it can be erased by Journal of Urban Academy. Our journal does not give guarantee which is not erased from database for articles rest more than a year in the online interface. Published articles cannot be removed from the publication with no external justification, except for legal obligations. Our authors can not demand removing from the publication of the published manuscripts without a court decision. 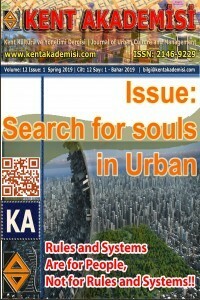 Journal of Urban Academy is quarterly a journal published electronically in kentakademisi.com website. Journal of Urban Academy is accepted an article in the areas of particularly urbanization, public administration, local government, political science, international relations, (local government) management science, law, urban planning, architecture, environment, environmental engineering, landscape, geography, human geography, statistics, business administration, economics, industrial engineering, labor economics, industrial relations, political history, religion/theology, religions history, art history, archaeology, history of civilization, etymology, transport, transportation, maritime, logistics, motor vehicles, traffic, communication, as well as disciplines such as literature, turkish language, personal development, human resources, ecology, renewable energy, environmental economics, defense, civil defence, internal/external security, public health, hospital management. Authors should be sent in WORD format via e-mail or doing registration and saving article in interactive environment to publish your articles. In addition, it can be sent articles on TÜBİTAK Journal Park System. Unless email confirmation does not receive, email senders will not carry responsibility. Our Journal is not responsible for documents lost and/or disappeared in an electronical environment. Articles may be Turkish or English. The title and abstract parts of articles should be one of the Turkish, English, German and French languages. Similarly, keywords should be Turkish and English. Paragraph space should be 12 nk and indent should be 0 (zero) in the articles. Namely, it is not used paragraph indentation. The article will never published if studies was published anywhere before. As for translation writings, it is defined publication name made translation, volume, issue, author and country. The content should be numbered systematically DRAWINGS, PAINTINGS, PHOTOS, SHAPES which is added to articles. Author’s right of publication has not obligation to transfer our site in case of clear articles and reviews sent Journal of Urban Academy for publication. Articles sent for publishing is scanned with ITHENTICATE programme in preliminary review stage of the editor. Journal Editorial Board decide whether manuscripts sent to be published are issued or not issued and how they will play a part in this journal. Editorial Board can make a request some changes in point of content and form from author in case of find necessary. The first page of the article should be play a part the title and short abstract of the manuscript. Furthermore, it should be defined acknowledegments and other notes related to study in footnote part under the first page. The name, surname, degree, affiliation and address of author should play a part in author part found in the start of article. Furthermore, it should be added to a short curriculum vitae for the author. The manuscript should be divided to sections considering content according to headings. The first and last are defined as Introduction and Conclusion. Others are numbered such as 1.1, 1.2 etc. It is used bold letters to define section headings. References should be numbered such as (1), (2) etc numbers within text and be written according to usage sequence in the manuscript at the end of text. Before abstract of the article, it should be written at least five keywords as Turkish and English. Journal of Urban Academy is free to all visitors. This Journal does not charge any article submission or processing charges. Yazı eklemede herhangi bir sorun yaşayan yazarlarımız can transmit on online@kentakademisi.com web adress via e-mail. If it is benefitted from others’ views or references in articles, reference notations is APA system.